Our crazy week and a half of hockey culminated with a trip to the 'hockey homeland'. As a birthday present to me, Jill and I for the second year in a row went to Canada to watch hockey, eat poutine and smoked meat, and have a great time in two of our favorite Canadian cities. We actually left Binghamton after driving back from Ithaca, heading north along Route 81 through Syracuse and Watertown before arriving in Gananoque, Ontario. We stayed at the Best Western Country Squire Resort on King Street East, a short drive off of the 401. This was actually the second time we had stayed at this hotel, our first stop here being in 2004 when we had the entire family with us and just wanted somewhere to stopover. The room was spacious, the bed more comfortable than others we had stayed in as of late, and there was breakfast included in the price, so who could beat that ya know? After breakfast we jumped back onto the 401 for our drive to Ottawa. The last time we were here (December), I had bought Jill some very warm mittens at a stand on the street near the Byward Market, but didn't buy a hat to go with them. So, first order of business after arriving in Ottawa and finding somewhere to park? Buy Jill the hat to go along with the gloves! We walked through the Byward Market and wandered through the shops on either side of it before settling on Zak's Diner for lunch. We had eaten here a couple of times on our last Ottawa trip, and it was pretty good eats, so we decided to go here again. We walked back to the Rideau Center after lunch with one task in mind - find Canadians de Montreal jerseys. We found them at the SportsShop, buying the red jersey for me and the white jersey for Jill. 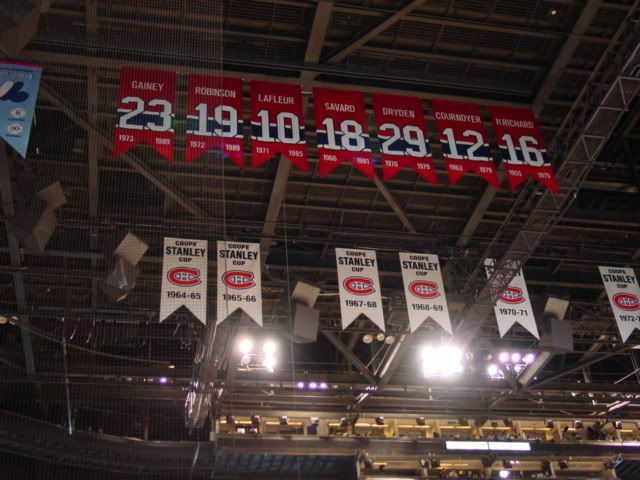 We were now all set to 'support the team' at the Centre Bell on my birthday. 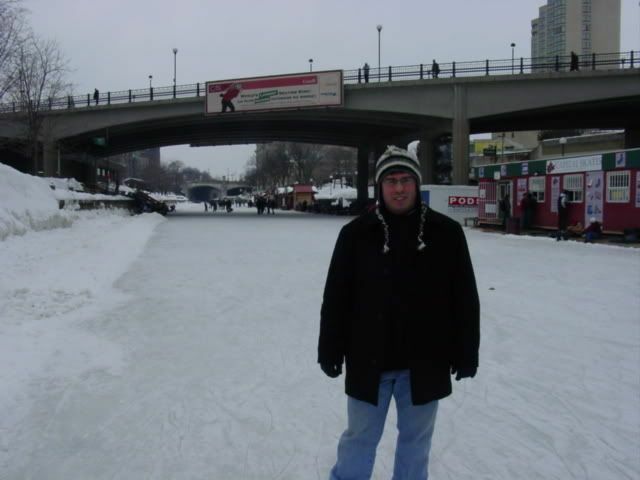 One of the quintessential Ottawa experiences is to skate along the Rideau Canal. On our last trip here, the canal had yet to freeze over, but we weren't disappointed this time! 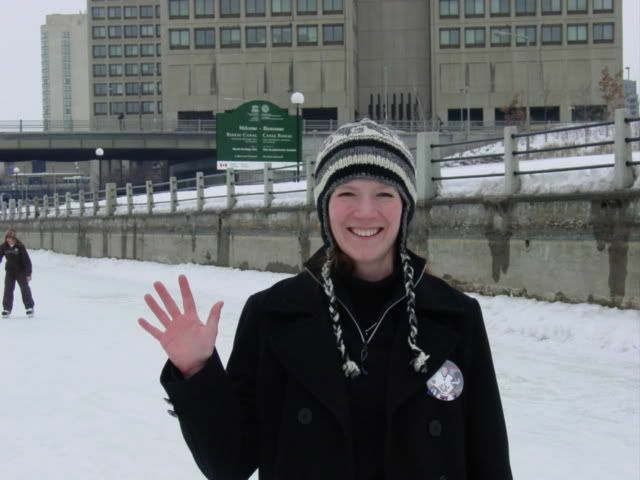 We made sure we brought along our hockey skates, laced them up at the Pont Mackenzie King Bridge and started skating. 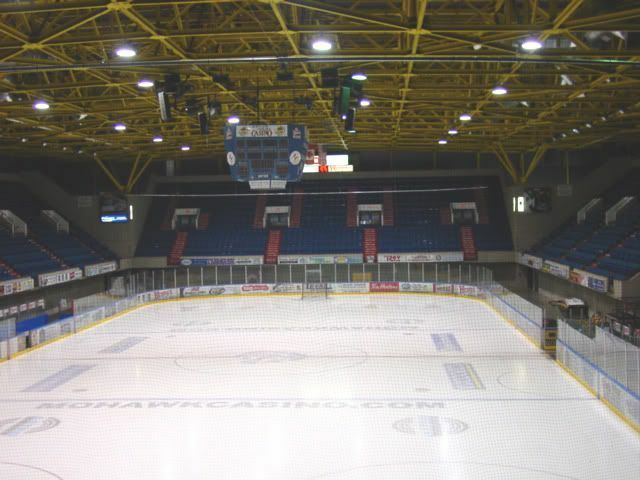 As we skated along, we commented on how spoiled we were always being able to skate on a clean sheet of ice that had been resurfaced by a Zamboni. This was ice skating at its purest and one hell of a workout as well! We made it almost to the Queensway Bridge before turning around and heading back. All told, we went about 4 km. We thought that with all of that hard work, we deserved a treat, so we sauntered up to the Beavertails hut and purchased probably one of the most delicious things we've ever had! It's fried dough, and the one that we got was topped/spread with Nutella! Yum-o!! Tim borrowing Jill's hat on the Rideau. 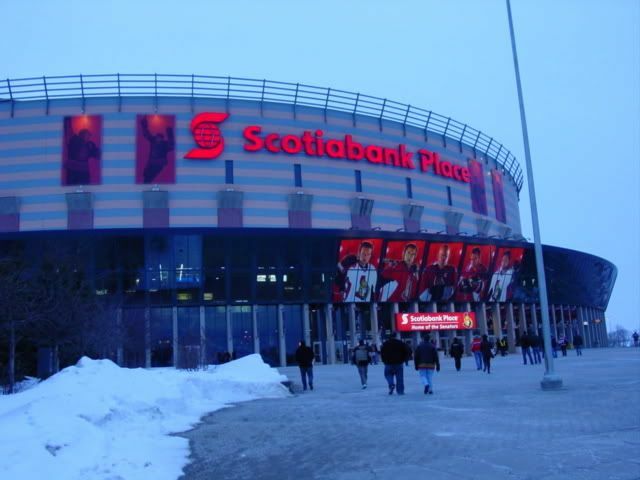 As is common in Ottawa, the traffic from downtown to Scotiabank Place can be pretty heavy a lot of the time, so we decided at this point to head to the area around Scotiabank. Stops at Canadian Tire, Chapters, a couple of sporting good stores, as well as somewhere to wash the car took up the time between our arriving there and going to the rink. We also stopped at Loblaws, and Jill bought me a yummy birthday cake! We arrived in more than enough time for the game, finding a place to park near the media lot across from the rink. We wandered the concourse, both first level and second level as well, before heading UP to our seats and settling in for the game. Toronto was dead last in their division, with the Sens in first closely followed by the Canadians. That being said, the "Battle of Ontario" always proved to be a tight battle with loud and voracious fans cheering on their teams. To put this game in a nutshell, it was probably one of the worst NHL games I've ever seen, and definately the worst I've ever seen in person. The crowd, even though we were in OTTAWA was decidedly Maple Leafs fans. So much so, when they scored (which they did more times than we wished to count) the place sounded like the home team scored. Embarassment point number one for the Ottawa Senators. Couple that with the fact that the Sens on ice play was nothing less than horrid (embarassment point number two), and this game all in all just left a horrible taste in my mouth. I truly can't remember the last time I left a hockey game as pissed off as I did this one. It's no surprise at all that two days later, John Paddock (the coach) lost his job, because it was obvious, even to those of us in the upper atmosphere, that this team didn't want to play for him anymore and did their best to play one of the most embarassing games in recent Senators history. After the game, we drove to Montreal in hopes of a better result and showing by the home team the next night. Jill did an awesome job last year in finding us a great hotel in Monteal, and she actually 'one upped' herself this year, quite possibly finding 'our hotel' in Montreal! The Hotel Vogue, located just three blocks from the Bell Centre and right in the middle of Centre Ville, was a great place to stay. The room was big, the bathroom even bigger (complete with a bubbly tub - yeah baby! ), it was just a great place to stay. We arrived late (or early), pulling up to the hotel around 12:30 on Tuesday morning. Our breakfast, which was included, was of the room service variety - we just put out the door hanger the night before marking off what we wanted and what time we wanted it and it was delivered the next morning. Both mornings we were there we each had a croissant along with a couple of other pastries, as well as tea (for me) and coffee (for Jill) and juice. In an attempt to add some 'culture' to our usual sports laden lives, we spent part of late Tuesday morning and early Tuesday afternoon at the Musee des beaux-arts de Montreal. We saw a few Picasso's, Degas, Monet's, and an extensive exhibition from Cuba. When we stared doing the Clark Griswold (from Vacation) routine, we decided it was time to go. Lunch time had hit, and after wandering for a bit we settled on (what else) the La Cage aux Sports at the Centre Bell. Pretty fitting place for lunch, since the 26th was trade deadline in the NHL. Even though all of the TV's in the restaurant were in French, we were still able to muddle through the news, which included the exasperating news that the Habs had traded away Cristobel Huet. Two years in a row that we were looking forward to seeing him play, and we got dissed again! 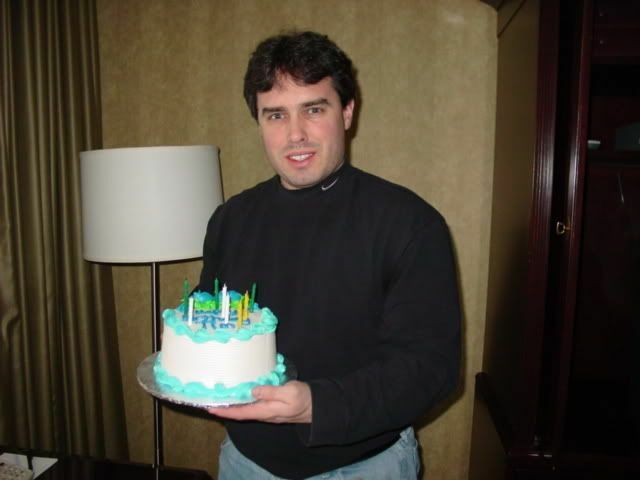 Here's the old man now with his birthday cake! Hopeful of seeing a better game on Tuesday night, we headed back to the Centre Bell. 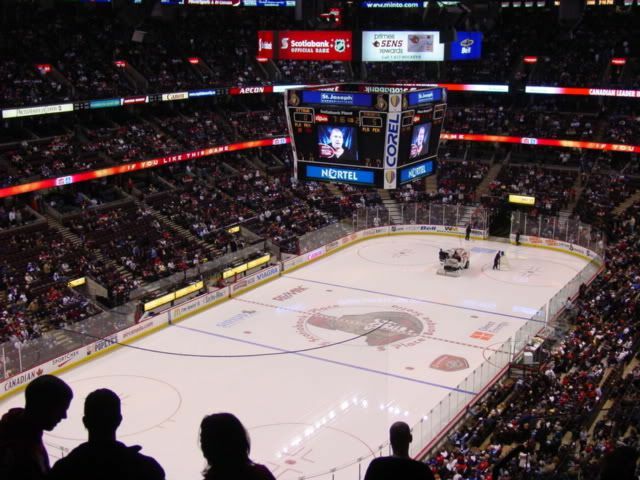 We had purchased tickets from the friend of a friend who had season ticket seats in the lower bowl of the Centre Bell. What awesome seats we ended up with too! I had my first smoked meat sandwich of the trip for dinner here, and Jill opted for the hot dogs. Both came with Molson's of course! The home team didn't disappoint in this game (thankfully), and the Centre Bell proved once again to be a great place to watch a game! As always, the fans were loud, into the game, and made it an overall great experience! Carey Price was the kid on the hotseat for this game, having been handed the goaltending reigns earlier in the day with the trade of Cristobel Huet. The kid played a great game - was very calm and poised for someone with the pressure that was put upon him (to lead the most storied NHL team in history back to the Stanley Cup!). Carey Price settling into his new role! 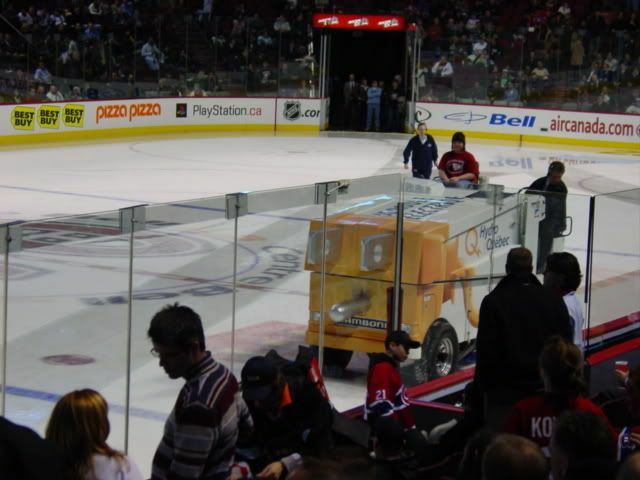 Is that a Zamboni, or a giant plug?? After the game, we trudged back through the freshly fallen snow back to the Hotel Vogue. The next morning, we slept in a bit, woken by the morning delivery of our breakfast. We had some breakfast, packed up the room, and said goodbye to the Hotel Vogue. Definately someplace we will find ourselves in again though!! We still had some Canadian money left in our pockets, so we stopped at the Casino de Montreal before heading south. We ate lunch there as well - my second smoked meat sandwich of the trip, Jill had some very tasty chicken (Labatt Blue to go along with our lunches too!). After we spent all of our money and filled up on the good food at the casino, we hopped back into the car for the drive back home. Along the way (we took the 401 out of Montreal to come back across at the same point we had come into Canada at), we stopped in Corwall to snap some pictures at the arena there. 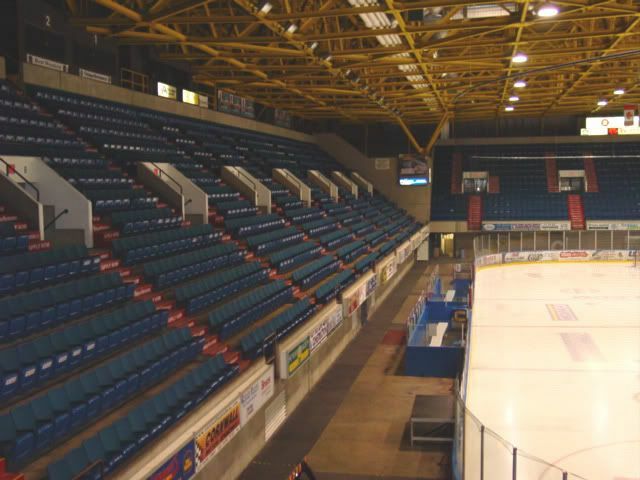 Ironically, it looks almost exactly the same as our rink in Binghamton, hence the reason we stopped - we just had to see it. And - WOW! it was just like being at home! Tired and exhausted, but well satisfied by our hockey adventure, we finally pulled in at home around 9:00 on Wednesday night. OTTAWA (AP) -Whatever changes Tuesday's trading deadline brings to the Toronto Maple Leafs, Mats Sundin's teammates are happy their captain is staying on board. Vesa Toskala made 31 saves for his third shutout and Darcy Tucker scored two second-period power-play goals, leading Toronto to a 5-0 win over the Ottawa Senators on Monday night. After exercising his no-trade clause to veto any potential deal away from the Maple Leafs with the deadline looming, Sundin scored on the power play in the first period. "I think everybody's kind of happy," Toskala said. "We know what's going to happen now. We don't have to guess anymore and I think that relaxed the room a little bit more." Asked if he was concerned he might be dealt, Toskala also expressed a desire to stay put. "It's always a possibility," Toskala said. "So many players are going to get traded, but it hasn't crossed my mind and that's something I hope I don't have to worry about." Toronto converted each of its first three opportunities with the man advantage. "We've played pretty well since we've had a fuller, healthier lineup, especially with our defense," Tucker said. "Vesa's played great for us in net and our defense has played well and given us an opportunity to win every night. That's obviously the team that everyone expected us to be." "We've been there all year and we know our play has slipped as of late, and the only way you can cure that is to get wins, and we didn't do that tonight," said Ottawa defenseman Luke Richardson, who played his 1,400th regular season game. "Now we're below, so now we have something to strive for." "I would think that it was a positive effect," Maple Leafs coach Paul Maurice said. "Regardless of what happens, everybody understands that it's business, but even in that locker room, these guys do it all together. They've had some rough goes this year and they're doing that together and when one of the - maybe the - key guy says, 'I'm staying with you,' that feels pretty good." "We know what it means for him to play here," Tucker said. Matt Stajan assisted on each of Toronto's first three goals of the second period, tying the franchise record for most assists in a period. "I got some good bounces tonight and Darcy did a good job of putting the puck in the net," Stajan said. Notes: Sundin was the most recent of several Maple Leafs to record three assists in the same period. He had three assists in the first period of a 4-2 win over Atlanta on Oct. 30, 2006. ... Richardson began his career with Toronto in 1987 after he was chosen seventh overall by the Maple Leafs in the draft. 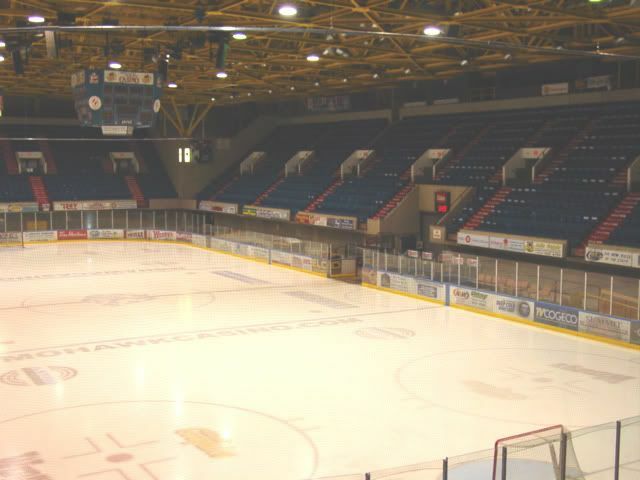 The Ottawa native has also played with Edmonton, Philadelphia, Columbus and Tampa Bay. MONTREAL (AP) -Chris Higgins showed how much he appreciated staying with the Montreal Canadiens on Tuesday night after he awoke from an abbreviated afternoon nap and learned he was still a member of his favorite team. Higgins had two goals and an assist as Montreal scored four times in the first half of the third period in a 5-1 victory over the Atlanta Thrashers. "I didn't sleep this afternoon," Higgins said. Higgins, the subject of trade rumors before Tuesday's 3 p.m. deadline, scored his 20th goal 2:10 into the third to give Montreal a 2-1 lead. He added his second goal in 2:46 with his 21st goal at 4:56. Higgins, a native of Smithtown, N.Y., has been a lifelong Canadiens fan like his father, a captain in the New York City Fire Dept. "I usually get a little nap in, but I went to bed with 20 minutes left in the deadline and didn't sleep the two hours I usually sleep," he said. "I woke up and wasn't moved so I was definitely happy, but I think everyone's relieved. It's a collective sigh of relief from our team. 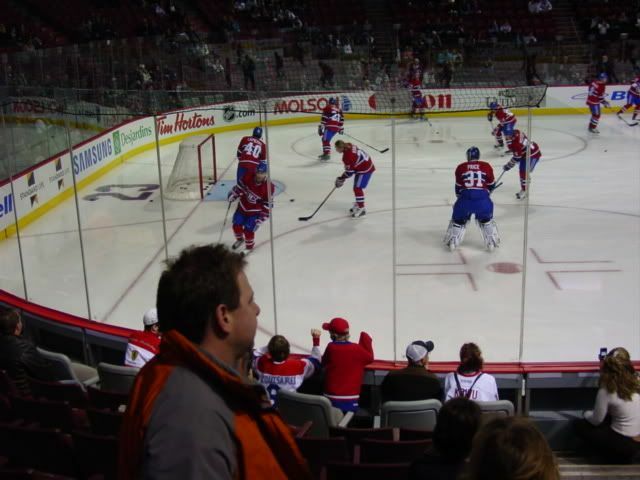 Higgins, chosen 14th overall by the Canadiens in 2002, set up Andrei Markov's power-play goal as the Canadiens increased their lead to 3-1 at 8:17, and Sergei Kostitsyn added Montreal's fourth goal at 9:04. 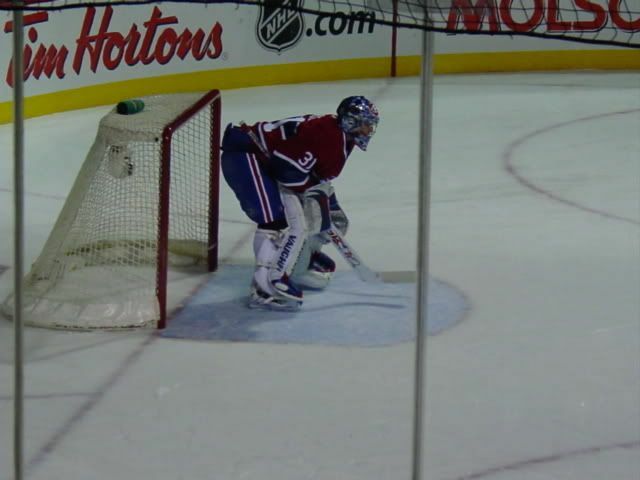 Carey Price stopped 26 shots and Maxim Lapierre also scored for the Canadiens, who sent goalie Cristobal Huet to Washington for a second-round pick in the 2009 draft in their only trade of the day. Ilya Kovalchuk scored his 41st goal in the second for Atlanta, which traded potential unrestricted free agent Marian Hossa to Pittsburgh before the trading deadline. "Of course it was a different day than usual, but there was still lots of time to get ready for it," said Kari Lehtonen, who made 28 saves. Thrashers general manager and coach Don Waddell had a busy day as he moved behind the bench to see his team drop its fourth in a row after he acquired center Erik Christensen, right wing Colby Armstrong, prospect Angelo Esposito and a first-round pick from Pittsburgh in the trade that sent Hossa and forward Pascal Dupuis to the Penguins. "It was bittersweet because Marian Hossa's such a big part of our franchise and we knew it was coming to this point, and you have to make these tough decisions and try to do the best you can with it," Waddell said. "We really like the deal we made and we'll get these players in here and try to turn the page and prepare for Thursday night." Price, selected fifth overall by Montreal in 2005, becomes the Canadiens' No. 1 goalie with Huet's departure. The 20-year-old rookie will be backed up by Jaroslav Halak, who was recalled from Hamilton of the AHL earlier in the day. Lapierre opened the scoring with his fourth goal 12:47 in. Kovalchuk tied it at 1 when he beat Price for a power-play goal 2:04 into the second. Higgins put the Canadiens ahead for good early in the third when he tapped in Michael Ryder's pass across the crease at the right post for the first of Montreal's two power-play goals in the third. He made it 3-1 moments later and had a hand in the Canadiens' third goal of the period at 8:17 when he put a pass from the right side to Markov, who scored his 13th goal into an open left side. Kostitsyn scored his seventh goal to increase the lead to four. Notes: Christensen and Armstrong will join the Thrashers in Atlanta on Wednesday. "We'll have a good skate (Wednesday) and try to set some lines for Thursday night," Waddell said. ... Atlanta recalled D Joel Kwiatkowski, LW Colin Stuart and C Bryan Little from Chicago of the AHL earlier in the day. All three dressed for the game. ... The Canadiens also recalled C Mikhail Grabovski from Hamilton earlier in the day. Grabovski assisted on Kostitsyn's goal. ... C Bryan Smolinski, RW Tom Kostopoulos and Ds Patrice Brisebois and Mathieu Dandenault were all healthy scratches for Montreal.